Make your '93-'02 Chevrolet Camaro or Z28 tough looking with this 30th Anniversary Style Rally Stripe Graphics kit. The pieces in this kit are precut and ready to install in a wide variety of colors - NO TRIMMING required! This stripe package is not just a set of 10" (25.40cm) straight strips in a box. Our graphic kit consists of prefitted and contoured pieces with a classic 0.25" (6.35mm) pinstripe border as shown in the illustration. 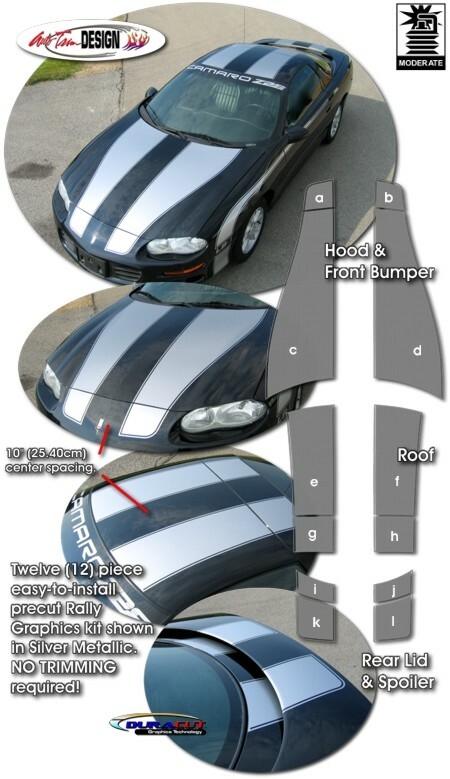 These kits are specifically made for the '93-'02 Chevrolet Camaro Coupe or Convertible (see Fitment Chart below) and will not fit any other vehicle. Stripe package is manufactured for a center spacing of 10" (25.40cm) as shown (to be set at time of installation).